In Bernard Suits’s 1978 book The Grasshopper, a fable-like pondering thesis on “games, life, and utopia,” several characters spend a great deal of time trying to define just what, exactly, a game even is. One of the aspects of games the characters discuss is the inefficiency of means: “Let us say, then,” the Grasshopper teaches, “that games are goal-directed activities in which inefficient means are intentionally chosen. For example, in racing games, one voluntarily goes all round the track in an effort to arrive at the finish line instead of ‘sensible’ cutting straight across the infield.” Golf, too, is a perfect example of this, and one that the Grasshopper himself refers to: “If my end were simply to get a ball into a number of holes in the ground, I would not be likely to use a golf club in order to achieve it, nor would I stand at a considerable distance from each hole.” Of course, the book then moves on to contest this very claim (using a golf club might be an inefficient way to get a ball in a hole, but using a golf club is not an inefficient way to play golf), but it remains a compelling notion: to play a game is to strive for some goal through inefficient means. Playing golf is an inefficient way to cross a desert, and this is the subject of Justin Smith’s wonderful mobile title Desert Golfing. At first glance, it is just another small, one dollar game for your iPhone or Android. You start the game, and your small ball is on a tee on the left of the screen, and there’s a hole on the right beside a flag with a hole number. There’s no menu, no instructions, just a 2D, side-on orange plane. You drag back your finger to make an arrow stretch in the opposite direction, and release to ‘klack!’ the ball in a slingshot motion, not unlike launching a bird in Angry Birds. At the top of the screen, a ‘+1’ appears. Take another stroke and it becomes +2. Finally get the ball in the hole on your third hit and that ‘+3’ gets added to your overall score and the +X score resets to zero. The camera slides across and the hole elevates itself so that the end of the previous hole becomes the tee of the next hole, and on you go again. After 18 holes, I expected to be told a score, to be given a three-star rating and dropped out of the game and onto a level-select menu. But this didn’t happen. This never happens. Instead, the camera just keeps panning across and I keep hitting the ball in one long, uninterrupted journey across this desert as my score goes up and up and up. It has a mesmerizing (and stressful!) sense of permanency about it. There is no looking back in this desert, no fixing past mistakes. 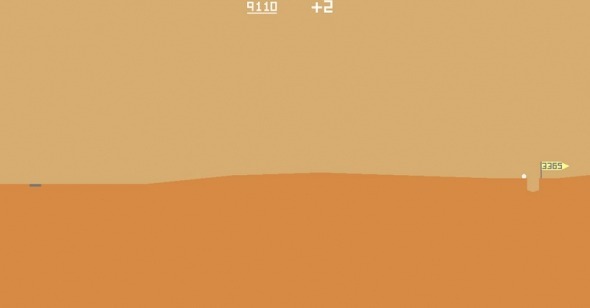 Every single stroke is added to that overall score; your overall score is always the total number of strokes you have performed in Desert Golfing. Short of deleting the game’s data and reinstalling it, there are no restarts, no practicing. Just you and the desert in a constant march forward. Whereas most arcade, score-centric games, from Space Invaders to Flappy Bird, are about inevitably dying, learning something, and starting again, Desert Golfing is a game in which you never die. But, paradoxically, this means every mistake feels even more permanent than that game-ending error in Missile Command. Your errors are not undone with failure, ready to be avoided on the next Groundhog Day. Instead, every single error sticks with you. After you take +110 shots to finish hole 243 and those 110 shots are added to your score, there is no removing them. You cannot go back and do it better, using the knowledge you learned from your terrible first attempt. Those strokes are on your score forever. Desert Golfing is majestic. Whereas Smith’s previous games—the utterly wonderful and absurd Enviro-Bear 2010 and the hilarious slapstick of No Brakes Valet—are noisy and chaotic in their presentation, Desert Golfing is restrained and confident. There are only ever three colors on the screen: the dark orange sand, the pale red sky, and the white ball and score. What at first seems incredibly simple (hitting the ball into the hole) gradually comes to demand a deep and intimate understanding of this world’s physics. As the holes progress you learn how to stop the ball halfway up a slope without it rolling down; how high to hit the ball to bounce it off one flat onto the next; what angle to hit a steep hill to stop the ball on the flat directly above it, rather than aiming directly for the flat which will inevitably lead to the ball rolling off the far side. Over dozens and hundreds of holes, new environments force you to learn new techniques, but always subtly and politely, persuaded, not ordered. If you haven’t learned how to stop the ball on an uphill slope after a few hundred holes, for instance, eventually you will encounter a hole you can only pass after stopping the ball on a slope. Most important to what Desert Golfing achieves is its continuity from one hole to the next: no menus, no fading to black between holes, no pause as the game gives you any kind of arbitrary three-star score. One hole ends, and the other begins. And so it goes, on and on for thousands and thousands of holes. I’m not sure how many holes, exactly. As I write this, I am marching along a great plateau in the 3500s. I think this desert has an ending, but to the best of my knowledge no one has yet reached it. As I continue my trek, my score goes up and up, now somewhere in the range of 10,000 strokes. But it’s not about the number of strokes, at least not anymore. It’s about getting to the other side of this desert. It’s about seeing what is out there. It’s telling that in a recent interview, Smith acknowledges Journey as an influence on the game. It feels like a “walking game,” that genre (or maybe a movement) of video games with minimal things to “do,” offering instead simply an environment to move through. Journey, Dear Esther, and Proteus are perhaps better examples of this. Smith, though, says he finds those games boring and wishes they had a bit more challenge. Golf becomes that challenge, the something to “do.” In Desert Golfing, you are not simply playing golf, you are trekking across a desert through the act of golf. Golf is the thing you do in order to move across this desert. Once you realize this, so much of the game’s design, its seamless transition from level to level, makes sense. This is a journey the player is on. Not a series of 18-hole courses that can be replayed and practiced and improved upon, but one long single desert to be explored, over hills and along plateaus and down cliffs. Through day and night. Desert Golfing is, at its core, a game about exploration. On Hole 537 there is a rock; on Hole 316 a cactus; and on Hole 684 a cloud floats in the sky. These sparse interruptions on the constant same-same-but-different landscape become exhilarating revelations. After about 1500 holes, you begin to notice the color palette is gradually changing (has always been changing?) from orange to red to purple to blue to green in what I interpret as the passing of day to night and back to day. Like Journey or Proteus or Dear Esther, Desert Golfing is a game about moving across a landscape and seeing what is there, seeing what surprises the designer has hidden in the landscape. By itself, it could be construed as funny that Smith made a game with thousands of levels that bored players will hit their way through just to see what is there. But what makes it remarkable is the careful attention paid to each and every level as well as to particular sequences of levels. All the holes are procedurally generated, Smith explains in the interview linked above, meaning that a computer algorithm working within certain parameters pumped out a bunch of levels. But there is also, clearly, human orchestration. There’s the slow and deliberate introduction of different environmental features, from vertical cliffs to overhangs to bottomless chasms. There’s Hole 1572, which combines an overhang blocking the hole with a chasm beside it; Hole 2866, which demands the player bounce the ball off an off-screen ledge; and, most beautiful of all, Hole 1930, with its floating block above an endless chasm, requiring a precision rebound shot. Each of these suggests a sadistic and deliberate human mind behind the game, an author’s finger scanning over each curve and hill and valley to make sure it functions just so. This isn’t just some desert vomited out by a computer algorithm, but one whose vastness has been (or at least, feels) carefully sculpted. I am 3500 holes away from “home,” and I only now feel like perhaps I am no longer in the presence of a designer, like maybe, finally, I have been thrown out into some wild, computer-generated unknown. But it’s not just the designer whose presence can be felt throughout the game, but also those of other players. Like in Journey, with its incredible multiplayer component that has players effortlessly dropping in and out of each other’s instance of the same desert, I am alone in Desert Golfing but I am also with all my friends. We each share our disbelief at hole 48, perhaps the first difficult level with its hole surrounded by downhill slopes one of which flows off the edge of the screen. We share tips and techniques, and screenshots of miraculous holes-in-one. The game’s minimalism and restraint echo Candy Box, A Dark Room, or Frog Fractions, each a game that starts with a very simple premise before revealing unpredictable depth. Each of these games became a communal exploration over social media, echoing pre-wikipedia schoolyard rumors of glitched Pokemon and Final Fantasy revivals. Desert Golfing, with its cactus and cloud and color gradients, draws each of us into the desert individually: we are unable to turn around, unsure where we are going, but we are going there together.